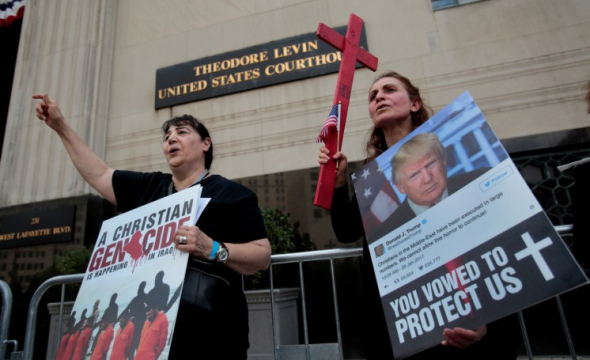 A U.S. district judge in Detroit ruled on Tuesday against part of President Donald Trump’s deportations initiative by stating that hundreds of Iraqi nationals, many of them Christians, that were detained earlier this year must either be released, or granted bond hearings. "Our legal tradition rejects warehousing human beings while their legal rights are being determined, without an opportunity to persuade a judge that the norm of monitored freedom should be followed,” U.S. District Judge Mark Goldsmith said, according to The Associated Press. Authorities must release detainees who do not get a bond hearing by February 2, unless they pose a public safety risk, the judge ruled. Back in July, Goldsmith halted deportation orders for as many as 1,400 Iraqis in America, some with past criminal convictions, arguing that their lives are at stake if they are sent back home. "Without a stay in place, deportations will begin immediately, which may mean a death sentence for some deportees,” the court found at the time. Trump’s administration has been attempting to deport Iraqis in a move to tighten immigration and security in the U.S., Reuters pointed out, with the Iraqi government agreeing in March to repatriate its nationals. Goldsmith said on Tuesday that there is no "no written agreement” with Iraq regarding such cooperation, however, and said that the conditions under which the nationals would be sent back are also yet to be made clear. Civil rights groups representing the detainess praised the latest decision. "(Goldsmith) just really reaffirmed the principle that indefinite detention in this country is not acceptable,” said Kary Moss, executive director of the American Civil Liberties Union of Michigan. Chaldean Christian activists and families cried out earlier this year against the arrests in Detroit and across the country of members of their community. "We can’t say these people went through genocide and send them back to be victimized again! We hope and pray that the issue gets resolved,” Pastor Jalil Dawood, the president of World Refugee Care, who fled Iraq as a refugee during the war with Iran in 1982, told The Christian Post back then. "America should never deport Christians to Iraq because they will be in trouble in Iraq as over a million left Iraq since 2003, and this will cause great hardship to their loved ones here,” also bringing "harm to them physically, mentally, and spiritually if they [are] ever sent back,” Dawood added. Many evangelical groups, including Trump’s own evangelical advisory board, have urged the administration not to deport the Iraqis. "It has also been reported that the individuals have criminal records. If the offenses they committed have already been ‘paid for’ by serving an appropriate sentence, facing a death sentence via deportation is disproportionate and unjust,” she added.